HBO’s phenomenal epic drama Game Of Thrones mines its best material from regime changes, the power shifts that ripple across the continent of Westeros yielding shocking betrayals, strategic realignments, and reversals of fortune. How appropriate then that, in its fifth season, Game Of Thrones is navigating its own regime change, as control over the massive, meticulous Westerosi ecosystem begins slipping away from George R.R. Martin, the novelist whose A Song Of Ice And Fire series inspired Thrones, and toward intrepid showrunners David Benioff and D.B. Weiss. Benioff and Weiss have cranked through Martin’s acclaimed door stoppers at a hare’s pace while Martin inches toward completing the final two installments, and the looming inevitability of the show outpacing the books has sparked a level of nerd anxiety not seen since Y2K was a going concern. 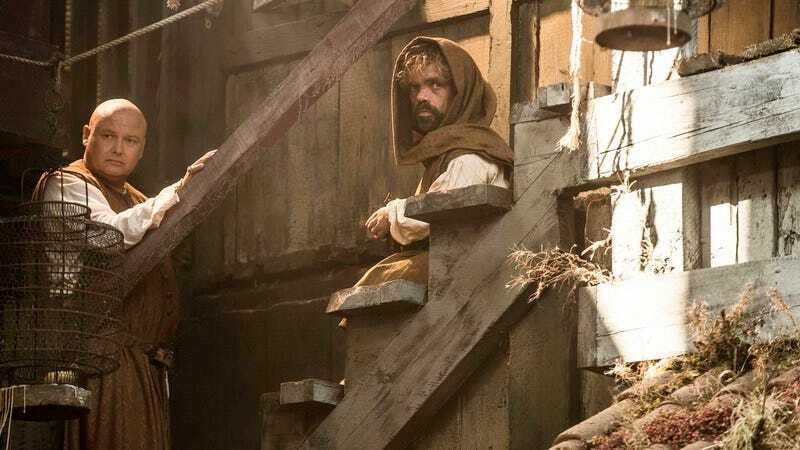 The first four episodes of Game Of Thrones’ fifth season are typically rich and rewarding, but for those seeking reassurance as the show heads for uncharted territory, there’s as much to love as there is to fear. As the sixth installment of Martin’s series has met with repeated delays, Benioff and Weiss have discussed how they would approach the narrative fork in the road, assuring fans they had a blueprint in mind for a post-Martin Westeros. Now that the showrunners are deploying that plan, their vision is starting to reveal itself, and their tweaks could make Thrones a far better show than they could have produced through slavish devotion to the source material. Martin prides himself on his ability to juggle throngs of characters thousands of miles apart, but while the books are structured to allow the characters to evolve independently, television shows work best when they find creative ways to maneuver their characters into the same space. Approaching the end of Martin’s continuity frees Benioff and Weiss to plot the show for the screen, and they waste no time rearranging the tableau and reining in Martin’s intimidating sprawl. The battle for the Seven Kingdoms wages on, but the coveted Iron Throne has faded into the background, and the efforts to claim it seem to stem more from habit than conviction. Newly crowned king Tommen Baratheon (Dean-Charles Chapman) would rather lay with his opportunistic queen Margaery (Natalie Dormer) than sit in the throne of power, much to the chagrin of Cersei (Lena Headey). Tommen’s sensitive, happy-go-lucky approach to ruling Westeros is a jarring change of pace, one complementary to the show’s central theme of ambivalent leadership. In a culture so fixated on the seizure and consolidation of power, the ambitious and high-born can crest the continent’s leadership without giving a moment’s thought to what that omnipotence means and whether it’s worth what comes with it. Daenerys Targaryen (Emilia Clarke) faces a similar leadership crisis in Meereen, where she faces unexpected resistance following the most recent stop on her emancipation tour of Essos. Daenerys craves the crown, but fears the result of amassing power too great for her to control. After forging her reputation as the mother of dragons, Daenerys watches helplessly as her flock of fire-breathers succumbs to their destructive, natural instincts, jeopardizing her stead at a time when she’s already faced with one wrenching no-win scenario after another. Of those vying for the crown, the only one who seems to be having any fun is Stannis Baratheon (Stephen Dillane) who is preparing for a grand resurgence at The Wall and lobbying a reluctant Jon Snow (Kit Harington) to enlist the help of the Night’s Watch. While Westeros is the same brutal battlefield it has always been, the early episodes of season five have a palpably different tone than that of seasons past. With the traumatic Red Wedding and cathartic Purple Wedding in the rearview, the urgency that fueled Game Of Thrones through the gradual decimation of House Stark and the malicious reign of Joffrey Baratheon is largely missing when the show resumes. The season premiere is titled “The Wars To Come,” a chunk of dialogue that also works as an implicit promise to viewers that the occasional hiccups in the first batch of episodes aren’t fully indicative of what the 10-episode season has in store. And lest anyone think the show has lost its unblinking violent streak, there are enough arterial geysers to satisfy even the most insatiable bloodlust. One especially sanguineous episode culminates in a bruising, lengthy battle sequence that doesn’t approach the scope of the battle of Blackwater, but will quell any concerns about a kinder, gentler Westeros. Game Of Thrones excels at fully rendered human stories in a fantasy world, a skill that is both reflected in and undercut by its tendency to build to gut-punching moments like its fatal nuptials or Daenerys’ fiery liberation of the slaves of Yunkai. 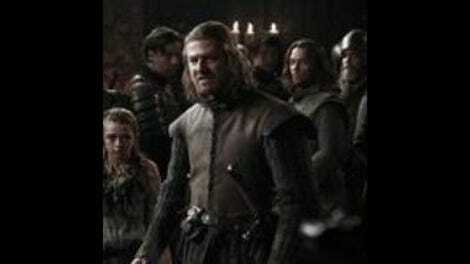 Benioff and Weiss are making the same show but with slightly different rhythms, relying more on character shading and interplay than on staging the next massacre. Season five also is more idea-driven, as Thrones dives headlong into the dueling religious beliefs in Martin’s elaborate universe. That too is a gesture of goodwill to the rabid fan base praying the show can maintain its quality standards without Martin, who’s so busy crafting the next novel he couldn’t free himself to pen an episode. Those prayers have been heard and answered, and by seven gods, no less.